A fun toy for your ratties! 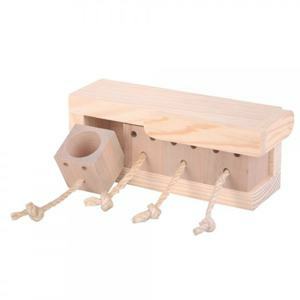 This is a wooden puzzle with four boxes that must be pulled or pushed to the end before they will come out. Simply place treats inside the boxes and let your rats use their brain to figure out how to get to them. Save a few pennies by ordering the box with a bag of no-added sugar mini drops by Trixie. See how our clever girl Flossie had it figured out by day 1! Video here!